This website was created in an Animal Biology course at the University of Wisconsin-La Crosse and is part of a greater project found at MultipleOrganisms.net. 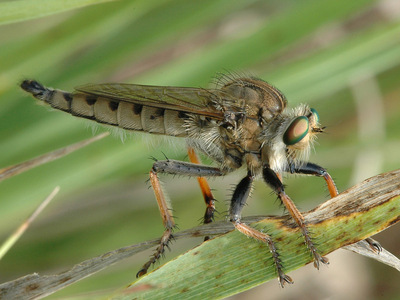 The purpose of the website is to provide useful information on the insect Promachus vertebratus, a robber fly native to the Midwest region of North America. Feel free to explore and learn about the underrated, interesting species: Promachus vertebratus. To get started begin looking at the classification, habitat, adaptation, nutrition, reproduction, interactions, facts, and gallery of Promachus vertebratus. Picture of a beautiful male Promachus vertebratus taken from WisconsinButterflies.org, a site with a plethora of information on robber flies native to the Wisconsin area.